Arsenal manager Arsene Wenger says Leicester City's success is proof that spending big money does not guarantee success in the Premier League. Wenger has been criticised in the past for not spending money on players. Some fans were unhappy he did not sign a striker before last summer's transfer window shut, despite knowing Danny Welbeck would be out injured. "Leicester is a fantastic example that football is not only about just spending the money," said Wenger. The Foxes are fives points clear at the top of the Premier League table with 13 games remaining after winning 3-1 at Manchester City on Saturday. Their starting line-up at the Etihad Stadium cost a reported £16.6m. Arsenal will move five points behind Claudio Ranieri's leaders if they win at Bournemouth on Sunday. Their only purchase of the winter window, which closed last Monday, was Egypt midfielder Mohamed Elneny from Basel for a reported £5m. 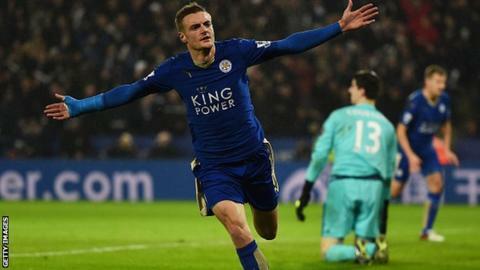 Leicester striker Jamie Vardy, who became the first player to score in 11 successive Premier League matches, joined from Fleetwood for £1m in 2012. Asked if the whole country was behind Leicester, Wenger added: "Of course. And it's natural. It's normal. "The advantage they have until the end of the season, apart from our fans and the [Manchester] City fans and Tottenham fans, the rest of the country is behind Leicester. "You reproach me about not buying big names, but you will support the team who has no big names."